Can Kramnik Win With The Black Pieces? Will It Matter? Vladimir Kramnik playing for a win. 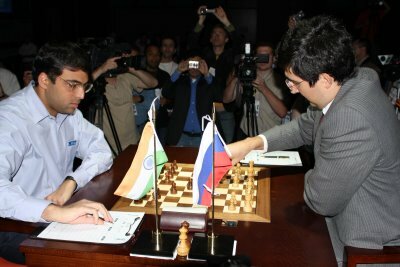 Between 1989 and 2008 Viswanathan Anand and Vladimir Kramnik played 51 head-to-head games under classical conditions. The results below show that Kramnik has yet to win a game as black when up against Anand. This is a remarkable statistic based on the number of match-ups these two chess players have had. Vladimir Kramnik’s win with white and draw with black strategy can hurt his tournament results but is exceptionally difficult to crack in match play. Unless he should find himself in danger of loosing the match, I would be very surprised if Kramnik changes his goal for the black pieces. This entry was posted on September 30, 2008 at 5:59 am and is filed under Anand vs. Kramnik, World Chess News. You can follow any responses to this entry through the RSS 2.0 feed. You can leave a response, or trackback from your own site.